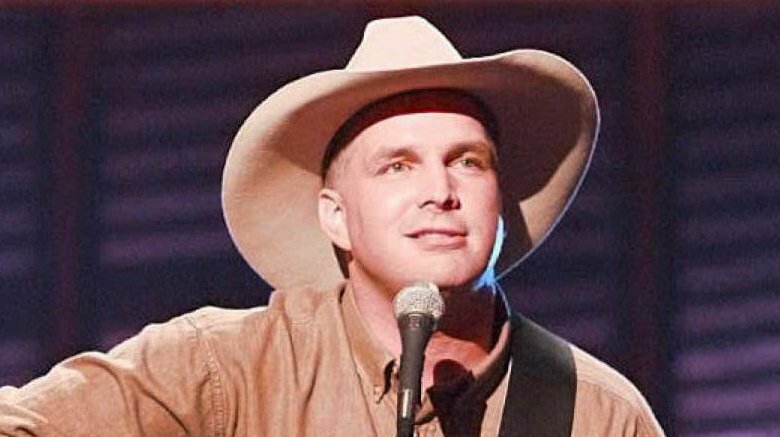 Troyal Garth Brooks was born on February 7, 1962 in Tulsa, Oklahoma and it's not just his rarely used first name that's surprising. As the best-selling solo album artist of all time (he snagged that honor from Elvis back in 2015), Brooks has had unrivalled success in the music industry. 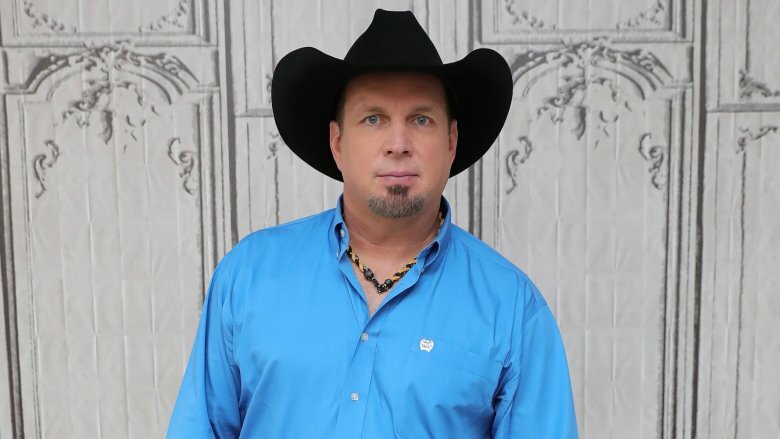 In addition to selling millions of albums and concert tickets since the release of his self-titled debut in 1989, Brooks has been nominated for numerous awards at the Emmys, Grammys, Golden Globes and beyond. But despite his long career in the public eye, there's a lot many don't know about the real Brooks, including his bizarre '90s alter ego, scandalous love life, short-lived baseball career, secret Super Bowl tantrum and more. As a firm supporter of the anti-streaming movement, Brooks has made it no secret that he applauds artists like Taylor Swift who have famously refused to place their music on streaming platforms. But it's not just Spotify and Apple Music that Brooks doesn't trust, it's YouTube as well. Sitting down for an interview with Access Hollywood in 2014, Brooks told host Billy Bush that YouTube is "the devil" because "they claim they pay people, [but] they're not paying anything. People get millions and millions and millions and millions of views, and they don't get squat. Trust me. Songwriters are hurting." Brooks went on to recount his meeting with the video streaming giant. After discovering that over 100,000 music videos and live performances of his had been uploaded to the site illegally, Brooks sat down with reps from the company. "I had the sweetest meeting with [YouTube]. They were all fired up," he told Bush. "They were the sweetest, and they're all, like, 12. So young! I said, 'I just have the first question: How do you get out?' Silence. You don't. You don't get out." The country star went on to plead for artists to "keep hammering away — unify, stick together — then music will become the king again, which is what it should be. Music should always be first." Despite a major shift towards digital music, Brooks is one of a handful of artists who continue to stand their ground, refusing to make their catalog available on sites like Spotify and iTunes. Where does the country musician's hatred for such platforms stem from? First, he doesn't think they pay artists fairly. Second, he doesn't want his albums to be split up into single tracks. As he told SPIN, his albums are "a reflection of who the artist is at that time" and he does not want listeners to be able to pick and choose and buy just a few tracks rather than the entire record. He wants fans to get the whole experience, whether they want it or not. Despite the fact that Brooks owns all of his master recordings, which means he stands to make a nice chunk of change on streaming platforms, he has continuously chosen to stay far away from them. As CAAMA put it, "Garth Brooks does not need iTunes, Spotify or any of the other retailers to reach his fans. He's going to be on a three-year tour… He's going to be promoting his record and tour like there's no tomorrow. 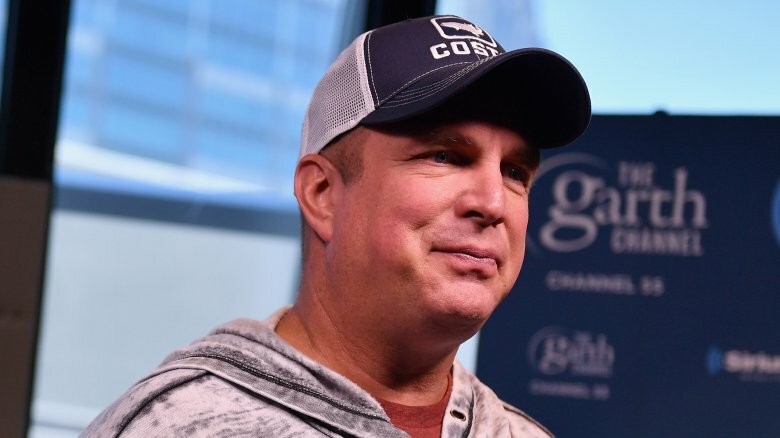 This will drive fans to one place and one place only: garthbrooks.com. That's exactly what he should be doing. Why should he drive traffic to anybody else?" A week after Amazon launched its Music Unlimited streaming service in October 2016, it announced that it had somehow managed to convince Brooks, who notoriously continues to refuse to put his music on streaming sites, to let subscribers listen to several of his best selling albums via the new platform. Amazon Music Unlimited said it would start by offering fans access to The Ultimate Hits and Double Live and promised to add more records in the future. Perhaps most surprising, however, was Brooks' willingness to sing Amazon's praises so publicly. "It is a joy to work with a company that is all about the customer when it comes to service, and all about the music and its creators when it comes to the music," he declared in a statement. Talk about a change of heart! It was 1989 when Brooks' then-wife, Sandy Mahl, discovered her man was cheating on her. When she threatened to divorce him, Brooks "got so choked up on stage in Sikeston, Missouri that he had to restart a song," reports PEOPLE. The huge show of emotion clearly worked, as Mahl gave him another chance. The couple renewed their vows in 1996, but at the 2000 American Music Awards, things took a turn for the bizarre when Brooks used part of his acceptance speech to address his wife and let the world know that "it's no mystery that our future … we don't know what's going to happen." 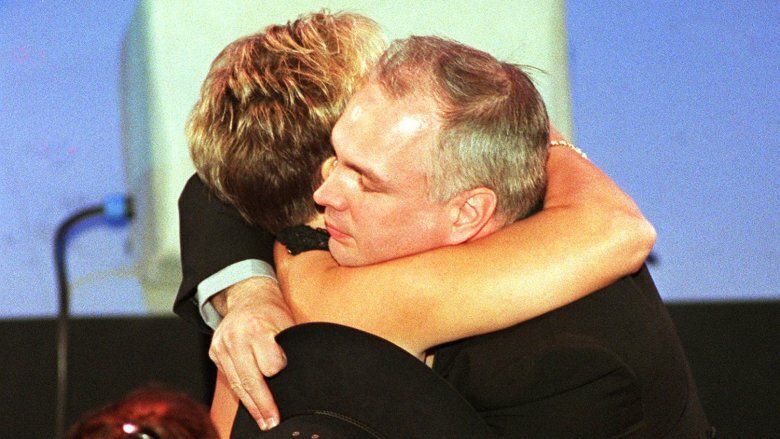 The pair, who met in 1983, finally called it quits in October 2000 after 14 years of a very rocky marriage. Brooks announced the news to Billboard (via E! News), saying: "Sandy and I both agree that we need to get divorced. Right now, we're focusing on the impact it will have on the children and how to handle that best, to remain parents even if we don't remain husband and wife." 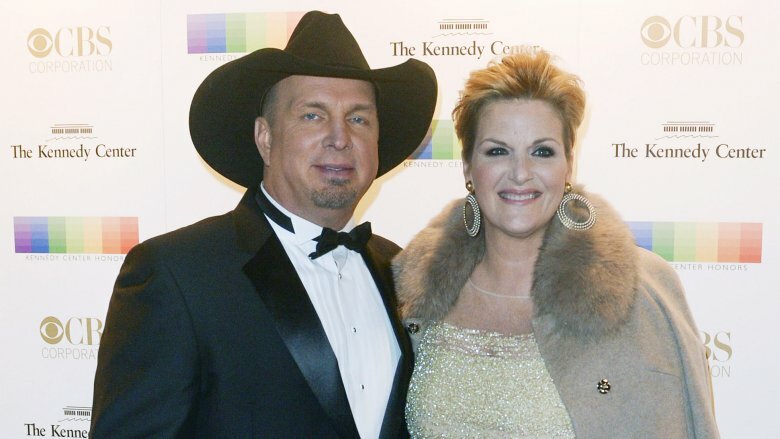 Garth Brooks and his second wife, Trisha Yearwood, first met in 1987 when they were both married to other people. Although rumors always surrounded the pair with many believing they were carrying on a secret affair, the couple has said that they only became romantic once they were both single. Sitting down with Ellen DeGeneres in 2013, Brooks spoke about falling for Yearwood, whom he married in 2005. Revealing that the pair was first introduced by a mutual friend, songwriter Kent Blazyhad, Brooks recalled that very first encounter, saying: "When she left, [Blazyhad] goes, 'What did you think?' I said, 'Well, it's strange, because I felt that feeling like when you just meet your wife, but I've been married for 13 months." Brooks went on to explain that he didn't make a move because he was committed to his vows, but didn't exactly paint his marriage to Sandy Mahl in a good light, saying: "So you keep hacking, and you work and you work and you work. And then comes that time where you're looking at the rest of your life going, 'How do you want to live it?'" Brooks concluded by singing Yearwood's praises, telling DeGeneres: "I never knew it could be like this. I never knew that everyday you could wake up and feel like this. And I have God and I have Ms. Yearwood to thank for this." Brook's "The Thunder Rolls" was a huge hit when it was released in 1990 and its accompanying video went on to win the CMA Award for Video of the Year, but the clip was so controversial, it was actually banned by TNN and CMT. In the video, Brooks acts out the song's lyrics, playing a cheating husband who disappears on a stormy night to meet his lover. His wife then decides to get her revenge, pulls out a gun and goes after him. Although the third verse of the song, which addresses the woman's dark plans, was left out of the video and was only hinted at, it was still considered too taboo to air. 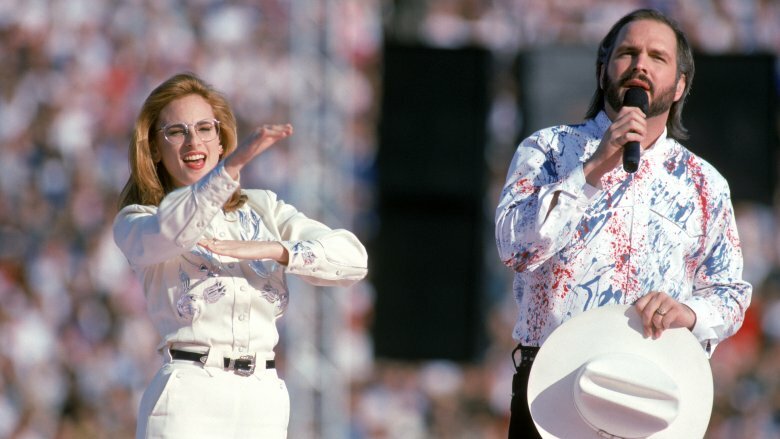 You may remember Brooks sang the National Anthem at the 1993 Super Bowl, but that nearly didn't happen when the crooner reportedly threatened to pull out of the show, just 45 minutes before kickoff. As former NFL Executive Director Don Weiss revealed in his book, The Making of the Super Bowl: The Inside Story of the World's Greatest Sporting Event, Brooks wanted to debut his video for "We Shall Be Free" (which features riots, burning flags and footage of the KKK) before singing the anthem, but it was deemed too controversial. So Brooks reportedly walked out of the stadium with less than an hour to go. Bon Jovi (who was attending as a fan) was placed on standby, but organizers finally caved, "and the biggest sports event in America was delayed for the first time in its history to show Brooks' video," reports Taste of Country. Because of the fiasco, the NFL then implemented a new rule requiring all artists singing the National Anthem to pre-record their performances. 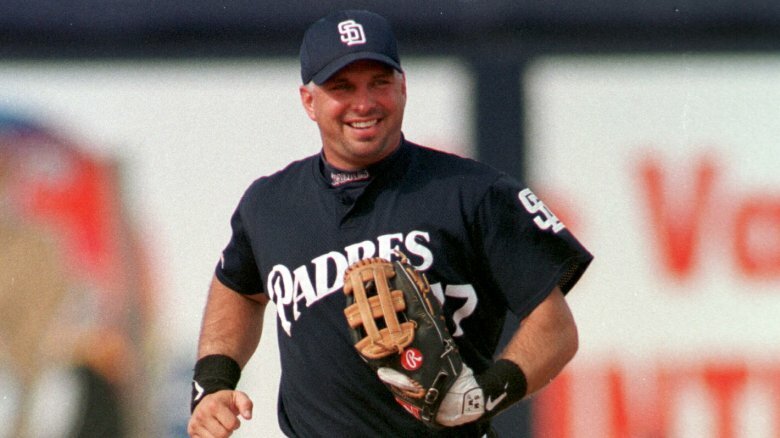 In 1999, the San Diego Padres made quite the shocking announcement when they revealed that they had invited Brooks to join spring training "on a non-roster basis." During a press conference revealing the unconventional partnership, Brooks said, "I'm excited, I'm nervous, I'm scared, and it's going to be neat. Make no mistake about it, I'm out there to play baseball." 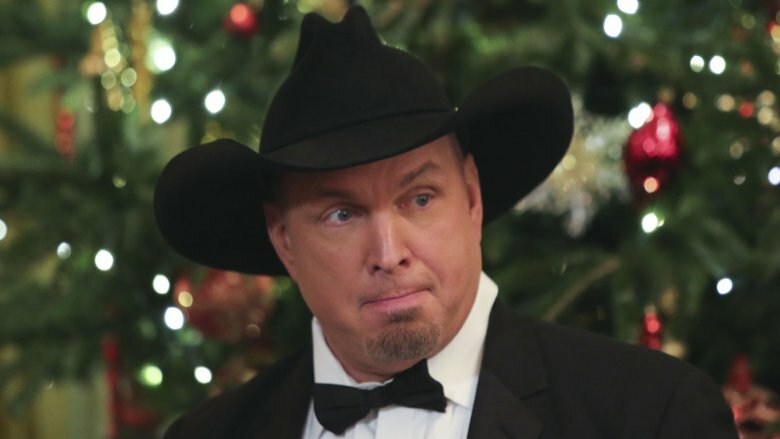 "The fact that people are going to go out there and just kind of laugh and chuckle, 'Oh, Garth, is that chubby cowboy going to try to play baseball? This ought to be fun.' I want people to walk up there and not expect to get what they're about ready to get from me in baseball," he concluded. Despite there being "no chance of him being on the major league club," Brooks committed to his role as a switch-hitter, taking a year off from touring and even missing the Grammy Awards in order to attend a training session in Arizona. Instead of paying him, the Padres donated $200,000 to his baseball-themed Touch 'Em All foundation. It was 1999 when Brooks released Garth Brooks Presents… In the Life of Chris Gaines, a bizarre record he performed as his Australian rock star alter ego, Chris Gaines. The album was supposed to set the stage for a thriller film, which Brooks was writing himself, about a Gaines superfan, titled The Lamb. No one expected the musician to embrace the role quite so wholeheartedly as to release a soundtrack recorded in the tone of his on-screen character. As Brooks put on an accent and dressed up in leather and eyeliner, he committed to the character in full, even giving interviews as Gaines. 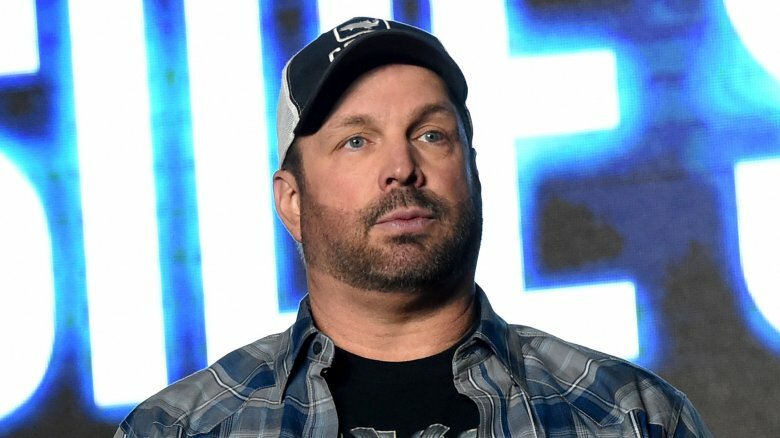 Speaking with the Los Angeles Times, Brooks explained, "We want people to go into the theater and know Chris Gaines and care about Chris Gaines. The thing I'd like to get across is how serious we are about this." But the project was not meant to be. 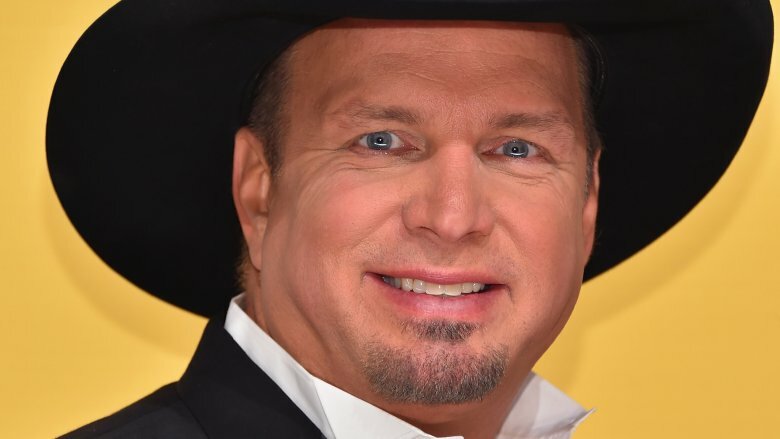 In The Life Of Chris Gaines only sold 2 million copies and doesn't appear on Brooks' official discography. As for the film, the plug was pulled on it and it was never made. In 2013, TV producer Lisa Sanderson filed a lawsuit against Brooks, whom she had worked with for two decades, alleging that the musician was a "paranoid, angry, deceitful and vindictive man who will turn against those closest to him on a dime." Sanderson claimed that she was hired to help launch Brooks' acting career, but that he made such extravagant demands (like turning down a role in Saving Private Ryan because he wanted to be the star) he lost all the opportunities she had lined up for him. In the lawsuit, which TMZ obtained, Sanderson demanded "$425,000 in unpaid bonus and salary, as well as punitive damages." Brooks eventually won the lawsuit, as a jury agreed that Sanderson was actually the one who owed the country star money ($226,000, plus interest, legal fees and collection costs, to be exact). Brooks argued that he had lent Sanderson the money while she claimed that it was a gift. In its verdict, the jury cited documentation that clearly called the money a loan. Not only is Brooks the best-selling solo album artist of all time, but he's achieved numerous milestones while on the road as well. Like selling 5 million tickets to his 2017 tour. The musician visited 60 cities before hitting the 5 million mark in Edmonton, Canada in July. While playing Rogers Place in Edmonton, he was joined on stage by Ticketmaster who presented the musician with a commemorative plaque. "It's really sweet," he told the crowd. "Thank you very much. That is awesome. I don't know how it gets better than that." What's more, Brooks had quite the surprise in store for the lucky fan who bought the five millionth ticket, as well as their partner. 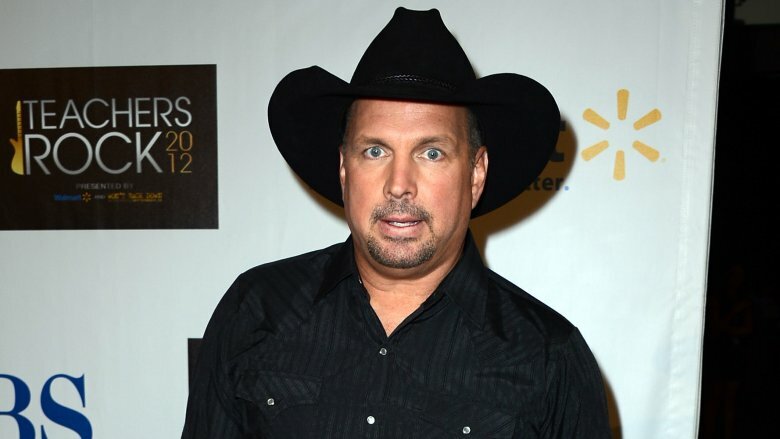 The couple received a seriously extravagant 'Thank You' gift from Brooks, which included a Lexus SUV, a Nissan truck, a $5,000 Amazon shopping spree, a $5,000 Edmonton Mall shopping spree, a trip for two to the Wynn hotel in Las Vegas and plenty of Garth Brooks & Trisha Yearwood merchandise, according to TMZ. Wowza!